This test ended up deliciously. I shot a rabbit the other night and thought I should explore an old cooking method called stone boiling. 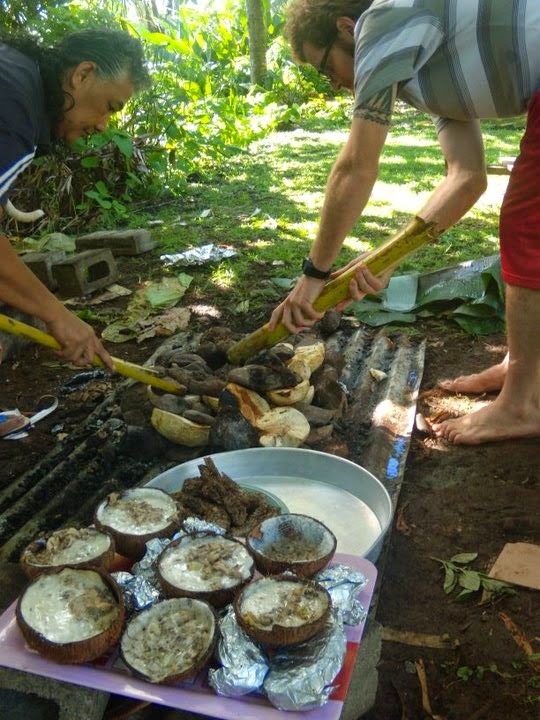 I have taken part in covered hot rock cooking plenty of times in the South Pacific and have excavated the prehistoric remains of that cooking method on several occasions. I had never tried cooking via stone boiling though. 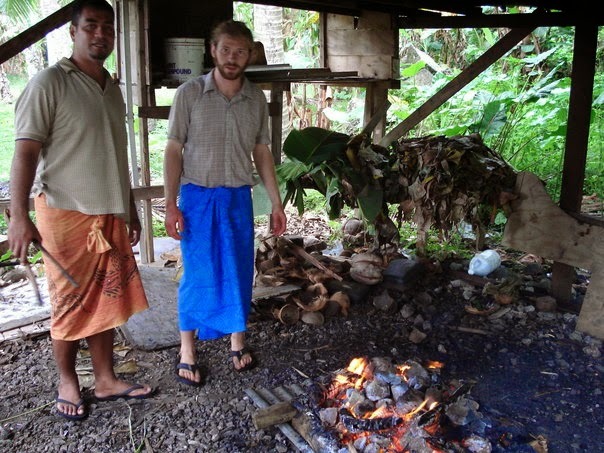 Prepping to cook a size 2 pig at Aganoa, Tutuila Island, American Samoa. Bloody hands and fire is pretty fun combo. 2006. Helping prepare a traditional Sunday lunch. Covering materials visible in background. 2010. Tovio taking the hair off of a size 4 pig in the village of 'Aoa. 2009. Wilson Fitiao taking a break from the fire in the village of Matu'u. Covering materials in background. 2010. 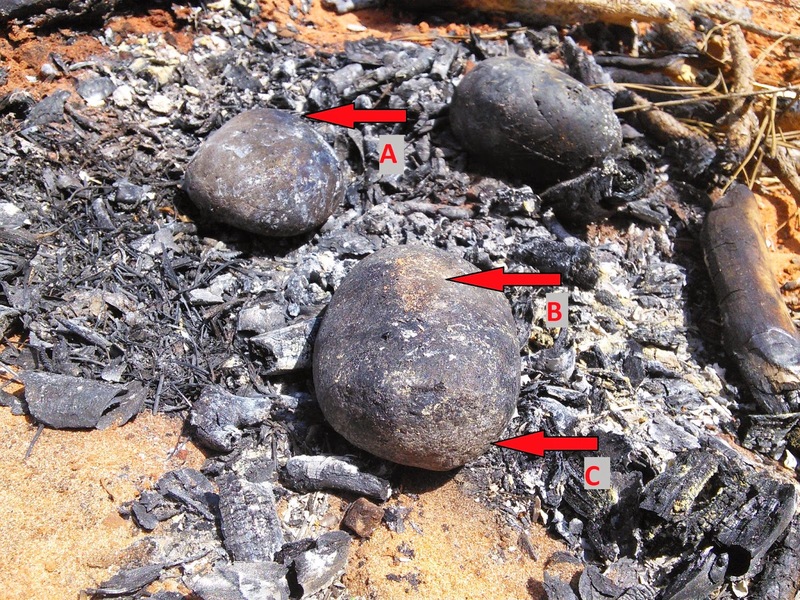 Hot rock cooking feature radiocarbon dated at 2400 cal. BP below volcanic ash at Vainu'u. The stones were placed near a structural post for reuse later, look at the placement of posts in my other photos. I wonder whose initials those are on the tag board? Cheap trowel that I snapped on 2700 year old cooking ash at Aganoa in 2006. First I needed a cooking vessel. I could have just used a metal pot, but where's the adventure in that, right? Luckily we had a few dried gourds laying about so I set out to make a bowl and spoon with a few stone implements. I cut the top off of the gourd, scraped the inside, plugged small holes with pine pitch glue and fashioned a spoon from the neck of the gourd. All together the process took about an hour and a half. I used chert for my scraper and obsidian for cutting tools. I already had a set of new blades and scrapers laying around so I just used those. A chert-only toolkit would have worked well but I didn't want to crack into a new core. All tools performed well and incurred some interesting edge damage from the soft pulpy wood of the gourd. The scraper exhibited polish along the working edge due to use. The obsidian biface incurred a few snapped corners, small step fractures within negative flake scars where the working edge was thinnest and dull polish along the cutting edges. The obsidian blade received continuous feathered nibbling along the worked margin. All told, more edge damage than I expected given the relatively soft composition of the gourd. Before too long I had a bowl ready to drop hot basalt rocks into for a forest meal. I used pine wood as fuel and three old basalt hammer stones approximately 6-7cm in diameter for a heat source. Rabbit chunks, squash, a small onion bulb and a little spice went into the mix. I alternated one hot stone within the vessel at a time while the other stones remained in the fire. Water began boiling after the second stone. My lunch failed to catch fire or break apart...a slight let down in terms of laughing while my lunch exploded. The rolling boil cooked the rabbit and squash within eight minutes. Ready for hot rock boiling. The plant is used to brush ash from the stone. I guess I have become used to things breaking, getting gashed, burned, stabbed or bludgeoned during tests so the smooth sailing of this foray would have been anticlimactic if the food hadn't have tasted so darn great. I will definitely be doing this again! Crawfish boil anyone? Attributes created during cooking. See below. For those of us that enjoy studying the process of archaeological site formation, here is what was left behind for another time. 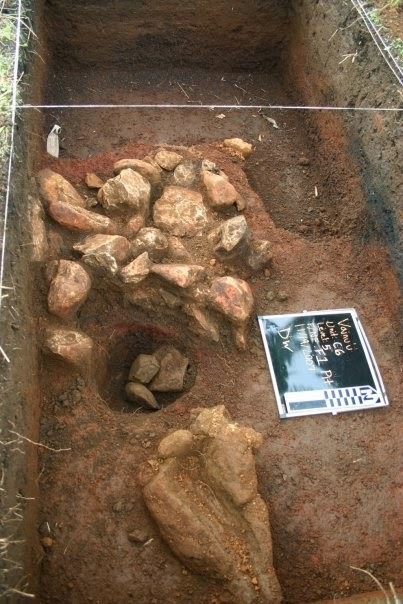 Several things are readily apparent: A) bluish thermal discoloration is evident on the surface of the cooking stones. B) animal protein is present where you see rusty brown material on the top of the stone. This occurred as the hot rock seared and stuck to meat within the vessel. C) recycling of lithic materials is evidenced by pecking along the margin of the stone in the foreground where I used an old hammer stone for a hot rock. I know where these rocks are, so I'll just return to this site instead of carrying the stones around with me.